The Solemates began showing up at my place around 9 a.m. for the 9:30 hike. Something like 30+ people showed up by 9:30 when we took off for the forestry gate and the trail head. Today we would go clock-wise. Most would go to Jury's Tree and then return to the cars. Others had options to "bail out" earlier. Because I've reported on this hike so many times in the past with still pictures I thought I'd do video this time. 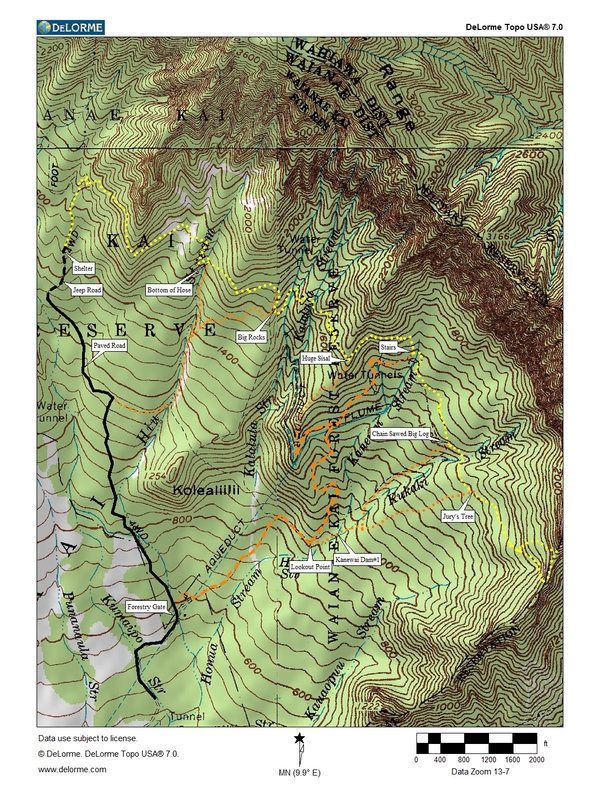 First is a map with the paved and dirt road in black, the Ramble in yellow and the bail out trails in orange. Then the links to the video done in two parts due to You Tube's 10 minute limit. Link to the Hawaiian Trail and Mountain Club's Home Page.